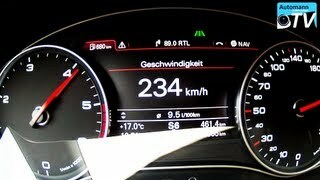 The German tuner, ABT Sportsline, adds more muscle power to the already powerful Audi A7. Along with the engine enhancements, the tuning package includes the front spoiler and rear skirt with a 4-pipe exhaust. The power is boosted to 282 HP and the torque raised to 610 Nm. This increased power offers the A7 quick acceleration and high torque, for quick over takes as well as faster pick ups at the signals! Your first glance at the elongated outline of the A7 is a magical moment which you will want to repeat again and again. Like an elegant feline predator, the vehicle shows that it is ready to pounce at any time and is very dynamic. The ABT side skirts support this impression further. They make the extravagant Audi seem even more muscular, it is a sports car in a perfect tailor-made suit. The front spoiler and the rear skirt set with the distinctive 4-pipe exhaust unit underline the fact that ABT has placed special emphasis on "sport" with the new A7 Sportback. "For us the A7 is a car whose optical qualities also must be reflected in its driving performance", explains Christian Abt. The General Manager of the traditional Bavarian company, who is responsible for technical developments, stresses that the A7 has to meet and the high demands of its owner, both as a premium road vehicle and as a sporting machine. This applies to both the 3.0 TFSI and the 3.0 TDI. "We think that the diesel engine suits the A7 perfectly, as it combines torque and unbridled power with the highest possible economy", says Christian Abt. With ABT POWER the series standard 245 HP (180 kW) is increased to a powerful 282 HP (207 kW). The big turbo diesel runs even more powerfully with ABT POWER S: this is because the "in-house" turbo charger from ABT SPORTSLINE is applied and the Sportback therefore brings 310 HP (228 kW) onto the road. With its powerful torque of 610 Nm the machine is both superior and offers high-torque and quick acceleration in every situation. The ABT A7 becomes a real sports car with a petrol engine: thanks to ABT POWER the six cylinders now offer 410 HP (302 kW), compared to the series-standard 300 HP (221 kW). ABT offers designer light alloy wheels in the sizes 19 to 21 inch to suit the extravagant Coupé limousine with the practical tailgate. The alloys are, of course, also available in combination with high-performance tyres, so that nothing else stands in the way of driving enjoyment. In combination with the lowering of the air suspension thanks to ABT Level Control, the ABT A7 now sticks to the road even more. Impressive performance, elegance and extravagance now have a new name – ABT A7.